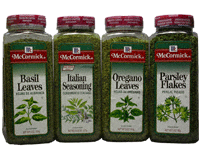 McCormick Parsley Flakes are often used simply as a garnish to add color to meals, it actually is a tasteful herb in it's own right. Parsley flakes are a delightful partner to cooking with garlic as the parsley takes the edge off of the garlic taste. Parsley flakes are the dried leaves of the biennial plant, Petroselinum crispum. It was originally grown in Southern Europe but is now grown in temperate regions throughout the world. Parsley has an agreeable taste and a pleasant, mild odor. It blends well with all other herbs. 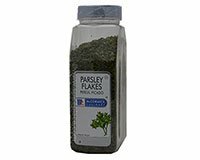 Parsley flakes can be used in and on foods to garnish and flavor canapés, soups, tossed green salads, coleslaw, breads, herb butters, sauces, stuffings, fish, meats, and poultry. Parsley flakes are used for both eye and taste appeal in most foods, except sweets. When used as a garnish, simply spinkle Parsley Flakes over the top of foods such as baked potatoes, mashed potatoes, rice dishes, salads, or anywhere a little color is needed in a meal. When used for flavor, add Parsley Flakes according to the recipe directions. We've assembled a collection of free recipes using Parsley for you.